One of the modules I'm doing at Uni this year is server-side development using PHP and MySQL. I've been eager to do this module so I decided to get a head start by spending some time over the summer break learning some from home. 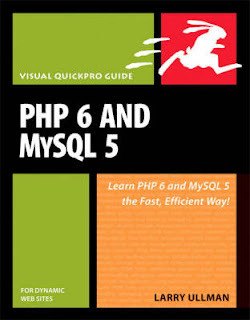 I installed WAMP (Apache Server, MySQL, & PHP) and purchased a the Visual Quickstart Guide PHP 6 And MySQL 5 by Larry Ullman. So far it's been a pretty good experience. It's easy to get up and running with PHP and I was able to get some way toward a fairly functional website within a couple of days. There's tons of examples online as well.